To Cite: Tosun H B, Agir I, Gumustas S, Serbest S, Uludag A, et al. Tibial Lengthening Using a Fixator-Assisted Lengthening Plate: A New Technique, Trauma Mon. 2016 ; 21(5):e25340. doi: 10.5812/traumamon.25340. Background: There are many techniques that are used for limb lengthening. Lengthening a limb over a plate is an alternative choice used in children or when using an intramedullary nail is difficult. Objectives: In this study, we presented a new technique for tibial lengthening using a monolateral external fixator over a lengthening plate. 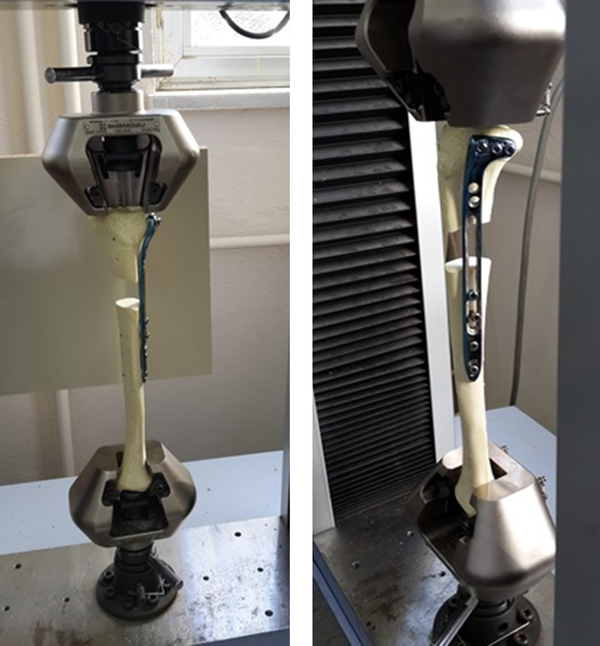 Materials and Methods: For tibial lengthening, a monolateral external fixator was attached to the composite bone model medially. After a corticotomy was performed, the lengthening plate was placed laterally. Three locking screws were inserted proximally, and two cortical screws were inserted into a lengthening hole that was 1 cm below the osteotomy site. We avoided contact between the screws of the lengthening plate and the pins of the external fixator. During bone lengthening with the monolateral external fixator, the screws at the lengthening hole were able to slide distally with the distal segment of the tibia to allow for tibial elongation. Two locking screws were fixed at the distal locking holes of the plate when the bone elongation was complete. The external fixator was then removed. 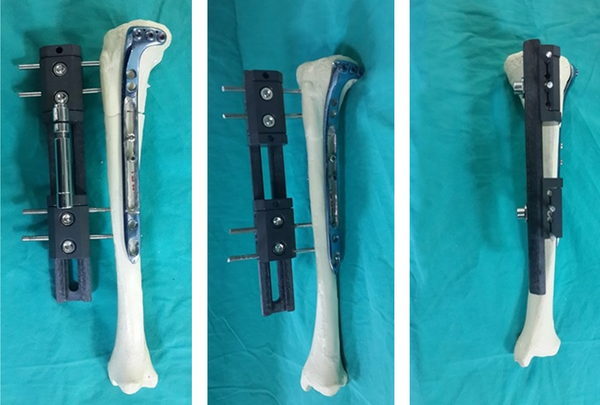 Results: The fixator-assisted lengthening plate allowed bone lengthening without malalignment. There were no mechanical problems associated with the external fixator during the lengthening process. Plate osteosynthesis was stable after the fixator was removed. There was no contact between the screws of plate and the Schanz pins of the external fixator under C-arm fluoroscopy. 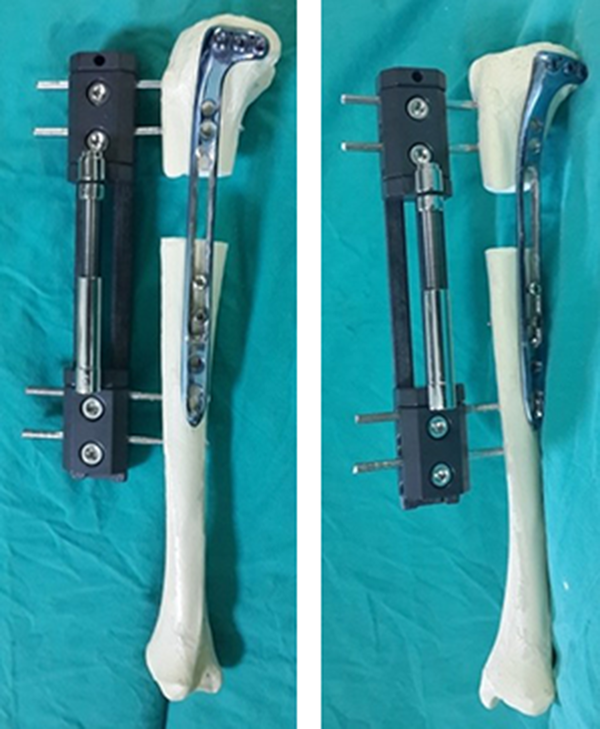 Conclusions: The fixator-assisted lengthening plate technique helps to maintain the stability and alignment at both sides of an osteotomy during tibial elongation. It allows the early removal of the external fixator immediately after lengthening is completed. This technique can be applied in children with open physes and in patients with a narrow medullary canal who are unsuitable for limb lengthening over an intramedullary nail. Distraction osteogenesis is an effective and widely used method for leg lengthening, deformity correction, and treatment of non-union fractures and bone defects (1-3). The circular and monolateral type external fixators are most commonly used for limb lengthening by distraction osteogenesis. However, the difficulties that may occur during limb lengthening include muscle contractures, axial deviation, neurologic or vascular injury, premature or delayed consolidation, non-union, pin site problems, and hardware failure. Late complications include loss of length, late bowing, and refracture. Most of these complications have diminished with the development of new technologies (4, 5). In recent studies, several combinations and new techniques have been used to improve patient satisfaction and to reduce the rate of complications. Some of these combined methods are lengthening over an intramedullary nail (1, 5, 6), nailing after lengthening (2), plating after lengthening (7), lengthening over a plate (8-10), lengthening over an elastic intramedullary nail (11), using an intramedullary skeletal kinetic distractor nail (12, 13), and using a motorized nail (14, 15). However, there are restrictions and challenges that occur with the use of all these techniques (1, 2, 7-10, 14). We investigated a new technique for tibial lengthening using a monolateral external fixator over a percutaneous lengthening plate. This technique could be used as an alternative for children or for patients who have a narrow medullary canal. We performed this technique on a third generation composite bone model (Selbones Research Laboratory, Kayseri, Turkey). First, a monolateral external fixator (Orthofix LRS; Orthofix, England) was attached to the medial surface of the composite tibial bone model using two Schanz pins distally and proximally. A corticotomy was then performed at the proximal metadiaphyseal junction of the tibia using drills and a handheld osteotome. Subsequently, the locking lengthening plate, which was derived from the lateral anatomical locking compression plate (LCP) that was used in the minimally invasive plate osteosynthesis (MIPO) technique, was placed at the lateral surface of the composite tibial bone model. Three locking screws were inserted at the proximal end of the osteotomy site and two cortical screws were inserted into a lengthening hole that was located 1 cm below the osteotomy site (Figure 1). Both the plate and the lengthening hole were long enough for the maximum amount of planned lengthening. We avoided contact with the pins of the external fixator during the placement of the screws of lengthening plate. 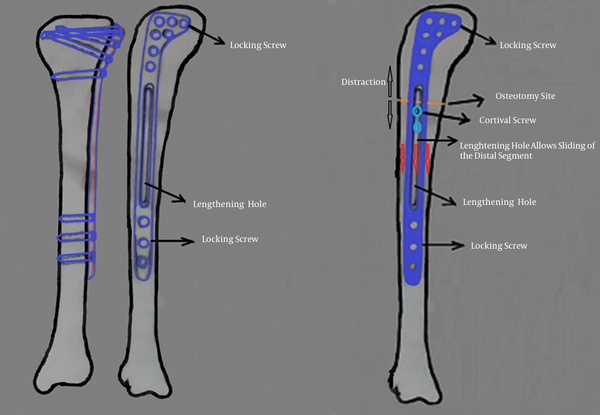 During bone lengthening with the monolateral external fixator, screws at the lengthening hole were able to slide distally with the distal segment of tibia to allow for tibial elongation (Figure 2). Two locking screws were fixed at the distal locking holes of the plate once bone elongation was complete. The external fixator was then removed (Figure 3). A biomechanical test on the model was performed using a tensile testing machine (SHIMADZU AUTOGRAPH AG-X/50kN, Kyoto, Japan) in the material laboratory of the material and metallurgy engineering department of technology faculty in our University. The model was mounted between two metal clamps and subjected to a compression deformation at a strain rate of 10 mm/min with 5 N pre-load. All assessments were made visually and biomechanically in our study. The fixator-assisted lengthening plate (Figure 4) allowed the lengthening of the model without malalignment (Figure 5). Plate osteosynthesis was stable after the fixator was removed, and there were no visual signs of displacement for the compressive stress up to 30 N/mm2 (Figure 6). There was no contact between the screws of the plate and the Schanz pins of the external fixator under C-arm fluoroscopy. In our study, we did not see any problems, including displacement, angulation, instability and lack of elongation, during the lengthening procedure. The lengthening hole was allowed to elongate without causing instability and malalignment. A computer-assisted device was not used to measure the amount of displacement between the fragments. All evaluations were performed visually. Distraction osteogenesis is an effective method of limb lengthening for patients who have a short stature (16). Distraction osteogenesis using circular fixators is a well-established technique for leg lengthening and correction of deformities (17). The circular frames provide stability, soft tissue preservation, adjustability, and functionality, which are vital for full osteogenic potential (18). However, there is a high risk for complications associated with the use of circular fixators. Monolateral fixation is often not able to withstand muscle forces especially during excessive lengthening (19). The technique of lengthening by the circular fixator can be difficult to perform and it is usually poorly tolerated by the patient. The prolonged time in a circular frame can lead to various complications, including pin-tract infections, postoperative scars, and joint contractures (1, 4, 5). Early frame removal can induce secondary axial deformity, shortening, non-union, and the risk of fracture (5, 17). Thus, it would be beneficial if the external fixation-wearing period could be shortened without increasing potential complications (20). Over the last few decades, intramedullary limb lengthening has become a viable alternative to traditional external systems (15). Intramedullary nails combined with temporary external fixators were first used in 1956 by Bost and Larsen (21) in order to overcome axial and rotational instability following external fixator application. Lengthening over an intramedullary nail was first described by Paley et al. (5) in 1997. This combination technique provided a significantly decreased external fixation time, which reduced the infection rate, allowed early rehabilitation, controlled the alignment, and protected the regenerated area until the consolidation of bone was complete (5). This combination technique gained wide acceptance because it provided patient comfort and satisfaction (22). Lengthening over an intramedullary nail was also used for the treatment of non-unions, infected non-unions, and defective non-unions (23). However, this technique could not be used in patients with knee problems, such as knee stiffness or previous septic arthritis (24), in patients with poliomyelitis sequelae, and in patients whose intramedullary canal was narrow (25). The main disadvantages of these combination techniques for bone lengthening include an increased risk of blood loss, intramedullary deep infection, and fat embolism, as well as problems with the retained hardware (5). In particular, Ilizarov (3) emphasized the importance of preserving the endosteal blood supply during distraction osteogenesis. There were concerns that intramedullary nailing could affect the quality of the regenerate during lengthening because the endosteal blood supply of the diaphyseal was compromised (26). It is technically difficult to use intramedullary nails in patients whose medullary canal is excessively sclerotic, is narrow, or has an angular deformity. For these reasons, minimally invasive plate osteosynthesis (MIPO) became an alternative choice for bone lengthening (8, 27). The MIPO technique preserved the perforating arteries and nutrient artery so that it improved periosteal and endosteal perfusion (27), and improved the biological healing without interfering with the osteotomy site. The locking plate also provided excellent angular stability (7). Combining an external fixator with a percutaneously inserted locking plate has all of the advantages that lengthening over an intramedullary nail provide, but it also eliminates the significant intramedullary infections risk that can occur with lengthening over a nail. This method also preserves the endosteal blood supply of the bone, which is disturbed during reaming. On the other hand, in skeletally immature patients, the locking plates did not interfere with the physes, which can be affected using intramedullary nails (10, 28). This method also had a lower risk for fat embolism than intramedullary nailing. The locking plate prevented loss of fixation and displacement of the transport segment, and it protected against the bending of the regenerate bone after the frame was removed. Also, it helped to neutralize the forces on the extremity and enabled early rehabilitation (9, 10). Plate insertion should be performed in a clean pin-free zone to eliminate the risk of infections (29). Endo et al. (7) reported that the MIPO technique with external fixators is advantageous in treating patients with diseases that have narrow medullary canal and complicated deformity such as achondroplasia. Using the MIPO technique with a LCP made it possible to shorten the external fixation-wearing period during the lengthening process. Oh et al. (8) reported that 10 patients who were unsuitable for limb lengthening over an intramedullary nail because of such factors as an open physes, bony deformity, narrow intramedullary canal, and joint contracture, were able to undergo submuscular plating after lengthening of the long bone. All patients were able to return to full unassisted weight-bearing, and had excellent joint movements and a solid union at the site of lengthening at follow-up. However, flexible nails were inserted to stabilize the distal segment during the lengthening of the femur in two of the cases (8). Iobst et al. (10) showed that lengthening over a submuscular locking plate technique was as effective as lengthening over an intramedullary nail in achieving goals of length (14.6%), decreasing the external fixation time for the patient, regaining range of motion, and maintaining patient safety. Apivatthakakul et al. (9) reported that MIPO combined with the distraction osteogenesis technique was an alternative method for bone transport as it offered some advantages compared with the Ilizarov technique or segment transport over an intramedullary nail. Harbacheuski et al. (29) reported that lengthening and then using an LAP decreased the time required for external fixation, but there was a high incidence of varus deformity. Residual procurvatum deformity and translation deformity of the regenerate have been seen in some studies (10). Our technique was different from other lengthening techniques that used a plate for bone elongation. Other studies reported performing the MIPO technique in two stages for bone lengthening (7, 8, 29). First, they performed bone lengthening with an external fixator. 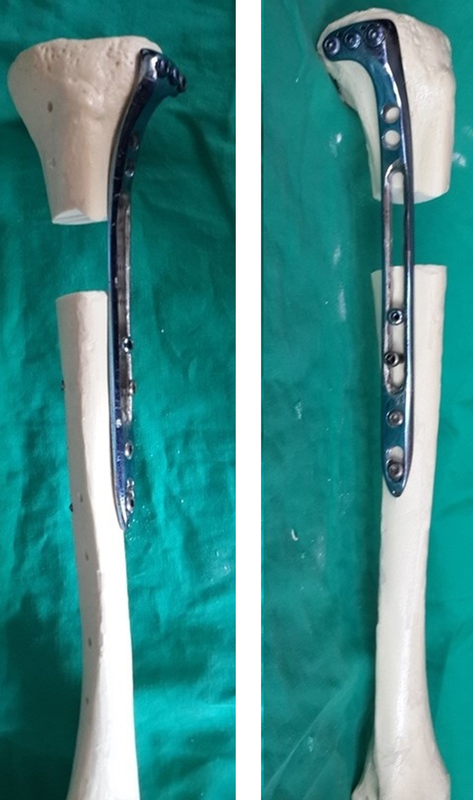 After sufficient callus formation and bone lengthening had been detected, an LCP with the MIPO technique was applied and the external fixator was removed during the same procedure. Iobst et al. (10) placed the external fixator and the lengthening plate at the same procedure. However, the plate at one side of osteotomy site was not fixed. In our study, the external fixator and the lengthening plate were placed during the same procedure. The lengthening plate was fixed with screws at both the proximal and distal ends of the osteotomy site. Our technique allowed bone lengthening without disrupting the alignment and distraction process. Thus, we proposed that the complications seen with other techniques would not be seen because the bone segments were stabilized. In addition, we placed the lengthening plate at the lateral surface, but the external fixator was placed at medial surface of the tibia so that the Schanz pins and the screws did not contact each other. This prevented possible cross-contamination, which can be seen with an intramedullary nail lengthening. However, plate insertion after lengthening with a circular external fixator is rather difficult, and there is risk for cross-contamination between the plate and the pins of the fixator. The limitations of this study include the lack of computer-assisted measurements of the displacement, the use of visual evaluation, the use of a composite bone model, and a lack of human patients. Our new bone lengthening technique might have more positive results in terms of malalignment and stability than other lengthening techniques. Also, this technique allows for the early removal of the external fixator, which could eliminate the risk of deep intramedullary infection that is seen with an intramedullary nail lengthening. This technique can be applied in children with open physes and in patients with a narrow medullary canal who are unsuitable for limb lengthening over an intramedullary nail. However, this study should be supported by future animal and human studies. Authors’ Contribution: Haci Bayram Tosun and Ismail Agir performed the technique and wrote the manuscript. Haci Bayram Tosun, Ismail Agir, and Seyitali Gumustas contributed to the discussion, reviewed/edited the manuscript, and researched the data. Sancar Serbest, Abuzer Uludag, and Suat Celik helped to draft the manuscript. Sancar Serbest, Suat Celik, and Abuzer Uludag researched data and contributed to the discussion. All of the authors read and approved the final manuscript.